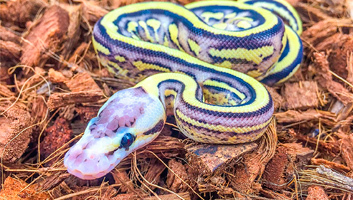 If you’ve never owned a snake before, you would be forgiven for not realizing how important it is to have good quality snake bedding in your vivarium or snake enclosure. Also referred to as a substrate, the best snake bedding takes a good few factors into consideration, which you may also not be aware of. Great for first-time snake owners, this article will go in-depth with everything you need to know about making a comfortable bed for your snake, including what you should be taking into consideration and what you can- and can’t- use for your new pet. As a bonus, we’ve given our top choices to away some of the necessary research required. So, read on to learn everything there is to know about snake substrate. Harvested from a renewable source and created to be 99.9% dust free, this aspen snake bedding from Zoo Med tops our list as one of the most versatile options for snake substrate. 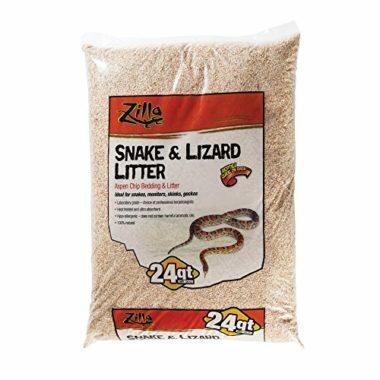 Great for many species, this snake bedding is perfect for burrowers and non-burrowers alike and can suit well in both dry and humid conditions. It's also super-easy to clean, both when you need to spot clean and when you’re doing a full disinfect and renewal. It’s super-absorbent, with a full 191% absorbency rating and is completely odorless, making it perfect for the comparatively over-active senses of snakes. Made from coconut fibers, this is a great, soft bedding for burrowing snakes who could spend all day making tunnels in this substrate. Reptile Prime’s offering makes for exceptional absorbency and naturally soaks up any odors, so this is a great choice if you have multiple snakes. Like our top pick, this can easily be used in both hot and humid tanks, making this another great, versatile option. 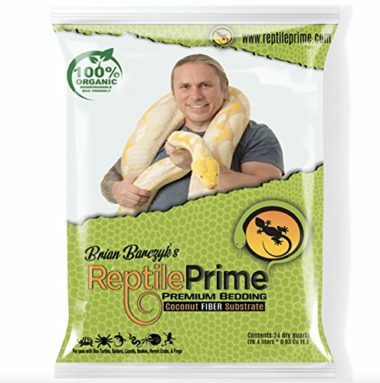 Reptile Prime mention that they have even taken the time to remove the dust from their products, which negates any unhealthy aspect about coconut fiber bedding and allows you sleep peacefully, knowing your snake is happy and healthy in their comfortable bedding. 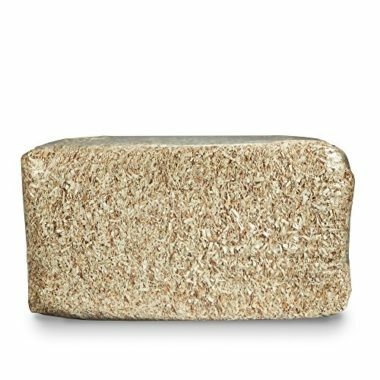 The perfect snake substrate for humid conditions, this coconut bedding is easy to clean, and is created using 100% organic and eco-friendly, using renewable sources for their materials. There are no added husk or fillers used in this product, which gives buyers peace of minds that they truly are getting what they pay for. Despite the level of humidity required for this product, you’ll notice that it doesn’t create mold easily- a huge benefit for snakes that prefer to live in damp conditions. Customers love how well this substrate holds humidity and find that it is surprisingly easy to work with, as you can have a little more control over the damp level of your bedding over other brands. They also note that this is easy to break apart (as it comes in a block format, which you’ll have to break down with water) and manageable when cleaning and re-filling tanks. 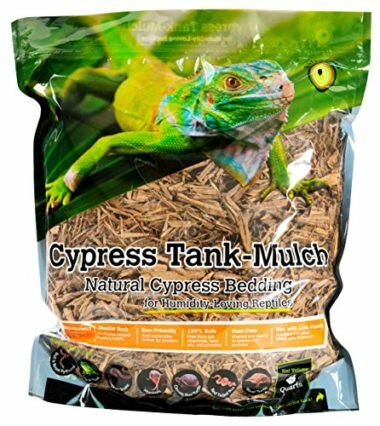 Designed to mimic the forest floor of your snake’s natural habitat, this cypress mulch is guaranteed safe from toxins, oils, parasites and chemicals. This is an eco-friendly option, made from timber by-products, that can work well with live plants in your tank- perfect if you’re looking to head toward a bio-active, self-sustaining tank. As this snake substrate is designed to imitate a tropical setting, this is a great bedding for snakes who enjoy humid landscapes and living spaces. That said, you won’t get a great deal of it, compared to others on our list and the natural processing has left some buyers with an unappealing ratio of dirt to mulch. Our recommendation is that you check out the quality of this option before using it, so you can return it if there’s too much dirt placed in your particular resealable bag. Another choice from Zoo Med, this forest floor bedding imitates tropical climates and is perfect for snakes who enjoy a humid tank. This option is made from 100% cypress mulch, which is one of our preferred substrate types for snakes, thanks to its compatibility with so many snake breeds and the versatility of the product. Zoo Med is always a popular manufacturer of snake substrates and beddings, and this is no different. Many customers are long-term buyers who appreciate the lack of any issues with mold or mites, despite the humidity of this choice. It’s also available at a great price compared to others of a similar standard, and you can get quite a lot in one order, depending on the size you choose, which makes it great value for money. If you’re looking to buy snake bedding in bulk, this bedding bag of aspen shavings from Kaytee is definitely the right choice for you. Completely natural, these shavings are designed to absorb odors and liquids exceptionally well and the lack of oils or chemicals in these bags ensures your snake will be as happy as they can be. Particularly good for burrowing snakes who prefer things a little dryer, this snake substrate has been filtered for dust and excess wood debris, which means you can be sure your snake won’t have any issues with this bedding. In particular, customers have been impressed with how soft this bedding is and how well their snakes take to it, creating tunnels to their hearts content and having owners who can easily clean around them. Size Up to 3200cu in. Another option for tropical species is Zoo Med’s coconut fibers, which are perfect for humidity-seeking snakes. 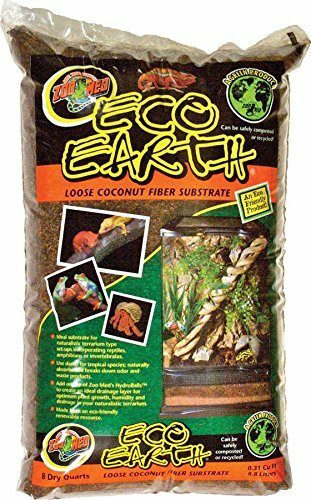 Designed to work with different substrates to create a full eco-system, this loose coconut fiber is made from coconut husk- ideal for starting a little biome in your tank. Customers love how easy this is to clean, since soiling tends to stay in one place and mention that there are rarely any bad smells, leading us to believe that this substrate has a great absorbency rate. They also note how well their snakes shed with this substrate as the earthy nature of the bedding seems to assist them in shaking off their old selves! While litter and sand generally aren’t the best options for snakes, we found that this Lizard Litter made quite the exception. 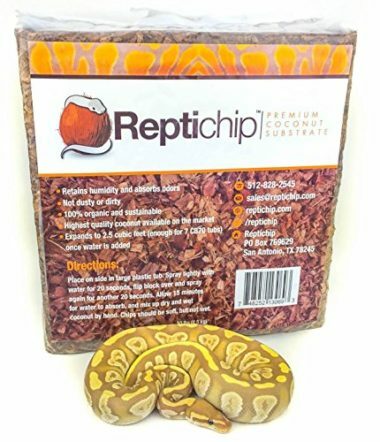 Made from heat-treated aspen chips, this hypoallergenic litter is perfect for sensitive snakes and reptiles, since there are no added nasties and the size of the chips are large enough not to get caught up in your pets’ system- but small enough to be easy to manage and easy to clean. They’re also very absorbent, 100% natural and laboratory-grade quality, making them very easy to spot-clean and perfect for your snake to burrow into. Customers have mentioned that the ability to hold moisture is exceptional, making the risk of mold and fungus lower drastically. In particular, it seems that corn snakes love this snake bedding. 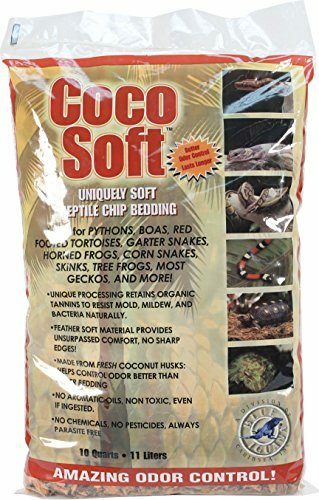 Naturally resisting mold, mildew and bacteria is an impressive feat in itself, but this Coco Soft reptile bedding from Carib Sea have gone even further to create one of the softest snake substrates on the market, today. Made from coconut husks, this bedding is naturally absorbent and Carib Sea have worked hard to produce a manufacturing system that ensures no chemicals, oils or pesticides were used at any point in the processing of this snake substrate. 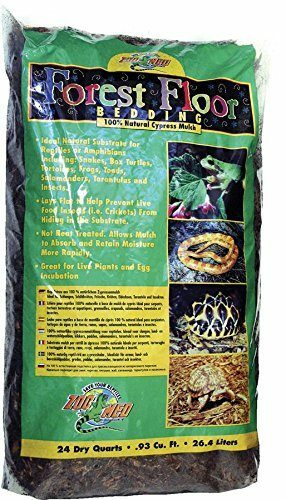 Perfect for snakes who love a bit of humidity, this bedding holds moisture surprisingly well and the mix or larger chunks imitates the forest floor perfectly- great if your snake likes to burrow into their new bedding. Our final choice in our top picks is this reptile carpet from Zoo Med. Designed to avoid any incidental inhalation or digestion of fibers, this is perfect for snakes who like to have a munch on things they probably shouldn’t try to eat. It’s still an absorbent option and comes in at a great price- especially when you consider that this is completely reusable. If you’re looking for the right bedding for a non-burrowing snake, then this carpet will be your best option. 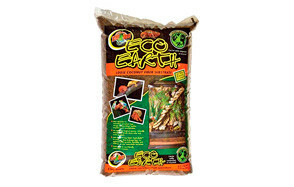 Made from a soft plastic fiber, from recycled plastic containers, this is a fantastic eco-friendly choice for those looking to lower their carbon footprint. It’s a great choice for those looking for a full lining for the bottom of their tank too, as it can be used in conjunction with many of the substrates found on our list. Just be sure to clean them out regularly, if you’re looking to do this. Bear in mind that the sizes cover the footprint of the carpet, so you might need to cut this to size and fit it together to create the right floor to cover the entire tank. We recommend buying two, so that you can thoroughly clean and dry one while the other sits in your tank. This is important, as every snake species will be from a different environment, naturally and therefore have evolved to get all snug and comfortable in a specific bedding type. You’ll want to imitate natural environment as much as possible, to ensure that your snake is happy and healthy. The size is important for the amount of bedding you’ll need to buy on a regular basis. We’ve included the capacity in our top picks for this reason, since you’ll want to know what works out as the best value for money, taking the capacity, quality and cost into consideration. Some snakes like to be in damp conditions, and others prefer their bedding to be completely bone-dry. You might find that your snake likes to burrow, or laze around. While you might find that the species of your snake can dictate a lot of their preferences, there will always be individual differences between different snakes. What works for one might not work for another, so it could be a good idea to try out a few different types of snake substrate or mix and match your substrate until you feel your snake is happy, healthy and comfortable with their new bedding. Since you’ll find yourself spot-cleaning areas regularly and changing out the entire bedding every few weeks, it would be wise to find a bedding that is easy to clean up. 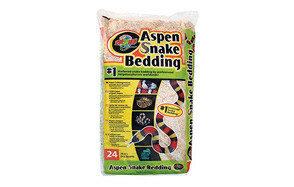 Your snake is going to be soiling the area frequently, and you should have a bedding that can handle this. For example, newspaper is a cheap alternative to many types of snake bedding but needs to be changed too frequently to be considered low-maintenance. Typically, not all bedding is good for every snake- or every snake owner. If you haven’t used any bedding before and/or this is your first snake, you should check out some of the pros and cons of the list, below. These will give you a good idea of what kind of bedding you might prefer- but don’t sell yourself on one of these, as your snake may decide they like something completely different. Cypress mulch is one of the most popular types of snake bedding on the market. It doesn’t come with an overpowering smell but is easy for your snake to burrow into and very comfortable for them to rest in/on. It’s also pretty good at maintaining moisture levels, which is ideal for many snakes including the ever-popular corn snake. The main issue with cypress is mites. If your tank does get infested, you’ll need to clean out your entire tank as mites love to hide in cypress mulch. It’s recommended that you bake your mulch until it’s dry, if you’re concerned about this- although that will remove any humidity, which is one of the reasons why so many people like to use it. in pet stores before, as it’s used for many small animals such as guinea pigs, hamsters and rabbits. This is the ideal bedding for burrowers, being light in weight and color- making it easy to spot when you need to clean out your tank. There aren’t really any negatives to aspen shavings, as long as your snake is happy in a drier climate. You should, however, be aware that the shavings are not too fine as this can lead to shavings getting caught between scales. Also, some companies dye their shavings to make them more appealing on the shelf- this doesn’t affect their ability to absorb odor or liquids but can stain your snake’s scales, too. Coconut fiber is soft and pliable, and carries natural odor-minimizing properties that stop any nasty smells leaking through the substrate. It can hold itself well in both humid and arid tanks, while still being as easy to clean as both aspen and cypress options. It is a great option for smaller snakes, particularly those who enjoy burrowing, although you’ll need to be sure to grab a batch that has a low dust level- something that can get caught up in their respiratory tract and cause breathing problems. Similar to carpet, AstroTurf or artificial grass is perfect for snakes that aren’t all that into their burrowing tendencies. You can usually get a few small pieces from a home improvements store, which you should then cut into multiple pieces- ideal for bringing out a bit at a time, as and when they need cleaning. They can absorb a lot of smell and liquid, however, so if you choose this option you’ll need to be prepared to clean these sections, thoroughly. It’s best to get some extra pieces so that you can slot in, while you clean- and each section needs to be completely dry before being replaced, too. These can work out as a very cheap alternative to artificial grass, as your local carpet store will likely cut away samples for you- and, even if you have to buy, the price per square meter is usually very reasonable. Again, they’re great for non-burrowing snakes and are generally pretty easy to clean and they’re unlikely to be ingested (be sure to get a tightly woven piece, if you’re still not sure). Be aware that you’ll need to replace these every once in a while, as they can soil easily. Easily available and usually very cheap (or free) to get, newspaper is still a popular choice for many new snake owners. All they need is a little cutting up and fluffing, and you’re ready to go. Naturally, these benefits come with a few downfalls, too. First of all, they aren’t very absorbent and will therefore need to be changed more frequently than others. Next, they’re only suitable for non-burrowing snakes since they are tough for snakes to get into and under (they’re far too light). Finally, there are some concerns about the ink being toxic, although most modern newspapers use an ink that isn’t toxic to animals. Small stones and pebbles can be ingested, which can be extremely painful and dangerous to snakes. They also aren’t able to hold heat as well as other options on this list and don’t hold any moisture. 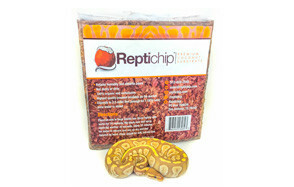 You can use larger rocks as decorations or as a simple stimulant for your snake to explore in their tank, however. Sand is a popular option as it works for both humid and arid states. It is easy for snakes to sit above or burrow into and is coarse enough to handle a little extra grip required during shedding seasons. There are a few theories that are doing the round online about whether or not sand designed specifically for reptiles is worth the extra money or not. The main issue being that there can be issues with your snake ingesting sand, as the burrow and move through the substrate. This can cause impaction and cause serious harm to your new pet. If you do think you’ll choose sand over any other type of substrate, you should be aware that reptile sand will usually be disinfected before packed and the grains are the perfect size for travel, while not getting stuck between the scales of your snake. A snake’s enclosure is about more than just the bedding/substrate. In order to keep your snake happy and healthy you’ll need to clean it out regularly, for starters. That includes removing everything in the tank, including the decorations and disinfecting the entire vivarium/terrarium. This can help stop any harmful bacteria getting near your snake, as well as yourself. Every day, you should be checking if your snake is eating and drinking well- and adding more food and water as is necessary. Check for parasites- especially mites, who thrive in the same conditions as your snake- and keep an eye on your snake’s feces, a change in which can indicate any health problems. Don’t forget to clean your hands after every check! Q: What is snake bedding / substrate? A: Snake bedding/substrate is a layer of bedding that sits along the bottom of the vivarium/terrarium. There are a few different types, the best of which would depend on your snake (see above) but overall, they need to be coarse enough to help them shed their skin, deep enough for them to burrow if they so choose, damp enough to feel comfortable and made from a material that is non-toxic to snakes. Q: Are there snake bedding alternatives? A: There are plenty of different bedding and substrate types that you can use, which we go into more detail above (“Types of substrates you can use”) but they must be compatible with your snake in order to give your pet a long, happy and healthy lifestyle. Q: How often should I change my snake’s bedding? A: The regularity in which you change your snakes bedding depends on a number of things- most notably, what type of bedding you use and how frequently your snake soils their bedding. If you’re using a bio-active set-up, which allows for a full ecosystem in your tank, then there is no need to clean your snake’s bedding once the system has been set up. Meanwhile, for the majority of bedding/substrates you should spot-clean areas that have become soiled, replacing the lost materials while cleaning. You’ll also need to give the full tank a deep clean every few weeks- minus the bio-active substrate- although keeping a little of the old bedding can be helpful for comfort, as it will keep your snake’s scents. Naturally, if the bedding is heavily soiled, then you should clean the full tank out sooner. 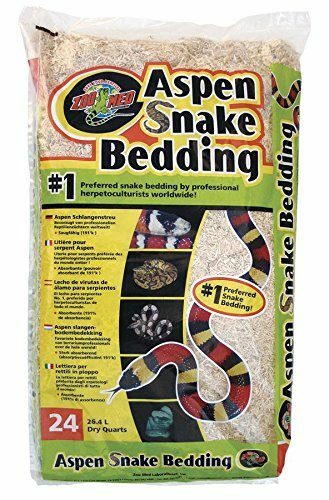 Being so versatile in the number of breeds whose needs can be matched, the Zoo Med Aspen Snake Bedding easily comes in as our top pick. It’s odorless, super-absorbent, soft enough to be comfortable for your snake yet firm enough that they can easily shed their skins. It’s easy on the wallet and easy on the soul, too with each bag of aspen substrate being sourced from renewable materials. Customers love how well this option soaks up any humidity and how it is so easy to clean- many customers mention that the light colors allow for feces to be spotted almost immediately and so, spot cleans are simple and quick- meaning this snake bedding lasts for a long time. Overall, this increases the value-for-money even further and makes this one of the best buys for snake substrate.